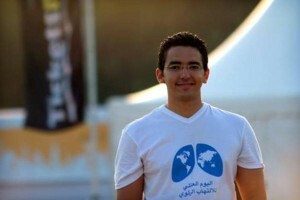 Mohamed Zaazoue, a 26-year-old Egyptian doctor, is creating a cultural shift in attitudes toward health and health care through his organization, Healthy Egyptians, which conducts health education campaigns to prevent diseases like pneumonia, the lead disease killing children under 5. According to UNICEF, around 40,000 children in Egypt die of pneumonia each year. Ironically, both pneumonia and anemia, which affects 66 percent of pre-school children in some parts of Egypt, are easily preventable diseases. So, in a system focused on treatment, Mohamed decided to emphasize prevention and start ensuring that Egyptians become active health-seekers rather than passive consumers of medicine. After finishing his medical degree in 2012, Zaazoue launched Healthy Egyptians, an organization whose main focus is creating innovative health educational tools, ranging from coloring books, cardboard games to a cartoon movie, called Montasser Overcomes, to prevent children from catching diseases prevalent in Egypt. By developing these tools, he is making preventive medicine interesting and easy. The organization also launched the Portable Child Cinema, a booth designed to be a cinema for children with small attractive chairs and a big screen TV, installed in different venues, including malls, impoverished areas and social clubs. In the future, Mohamed intends to produce a series of 30 different books and 30 cartoon episodes to cover the whole spectrum of diseases and bad health habits prevalent in developing countries. He also wants to make the existing health educational tools available to any entity or NGO across the world that intends to spread health awareness to children in a creative and appealing way. Mohamed comes from a family of doctors, as both his father and grandfather held the same profession. While his father had relocated the family to the United Arab Emirates (UAE) for work, Mohamed decided to study medicine in Egypt. During his rounds in hospitals, which he started conducting early in his medical career, the young Egyptian was surprised to discover that, as opposed to the UAE hospitals, in Egyptian ones, there was almost no knowledge transfer from doctor to patients. Mohamed started filling the gap, by taking the time to explain to patients the needed details about their diseases and how to prevent another visit to the hospital. After conducting an exchange program in the UK, where he saw patients come informed about their disease and prepared with questions for their doctors, he became further convinced of the need to ensure that Egyptians were more informed. Thus, Healthy Egyptians was born. Until now, around 600 volunteers have helped him in his initiative. For his incredible work, Mohamed has received recognition, both nationally and internationally. In Egypt, the Ministry of Education allowed him to host information sessions on diseases in primary schools, in order to identify a champion in the school to train and lead the program throughout the year. His work has also been featured on national TV, radios and magazines during a campaign leading up to World Pneumonia Day. Internationally, Mohamed was chosen as an Ashoka fellow and selected as among Forbes 2014 ’30 under 30’ under the Social category. Apart from running his organization, the young Egyptian is also enrolled in the Neurosurgery residency program at the Ain Shams University Hospital. In terms of future plans, Mohamed intends to reach an increasing number of beneficiaries inside and outside Egypt and to incorporate his tools into the Egyptian curricula.